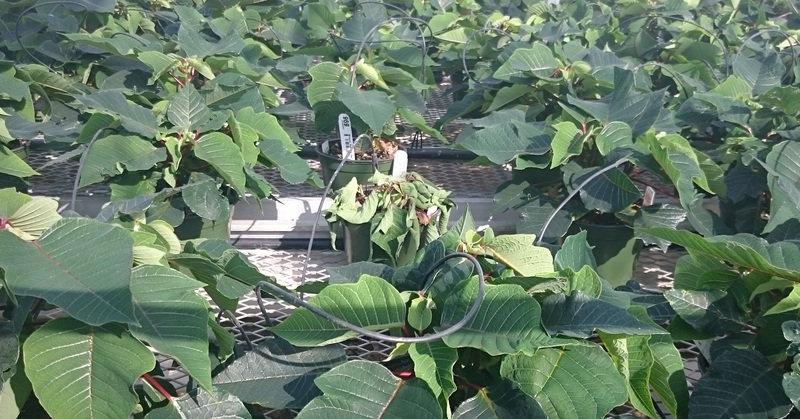 Now that poinsettias are safely tucked into their prop trays and the threat of Erwinia (Pectobacterium) is almost over, it’s time to think about other Poinsettia issues. Root rots, nutritional issues, environmental stress and PGR mistakes can all be costly in this high-value crop. Read on for common pitfalls and how to avoid them. Fainting “Freedom Red”? Wilting “Whitestar”? Potential causes of Poinsettia collapse, solutions, and the importance of testing. From now until mid-November is when you’ll most likely see plant losses in poinsettia due to severe wilting. These losses can be considerable: anywhere from 2-15% in Niagara operations in past years, with disease pressure seeming especially high this year. 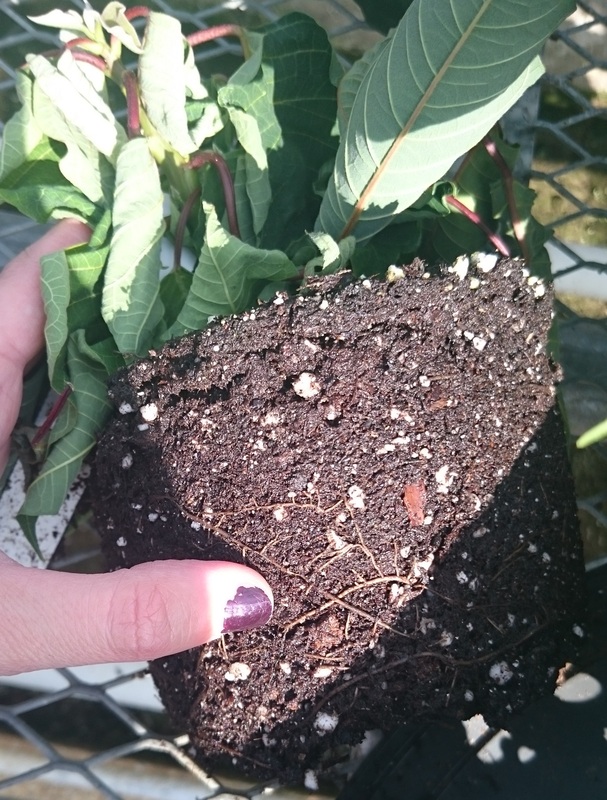 Pythium may be considered the most “likely” culprit in Poinsettia in this area, but this isn’t always the case, and misdiagnosis can mean wasted fungicide applications. Read on for a list of likely suspects and appropriate control measures. Floriculture IPM Check-in: What’s working in Points? It’s that time of year again, where the struggle against pests of poinsettias is real. So I thought it was time for a summary of what’s working in the industry, and what’s not. (Beware! This is a longer post than usual!). It’s no surprise that the biggest pest issue in Points is still Bemisia whitefly. For those of you relying on pesticides as your tool of choice, it’s time to cross your fingers and hope you’ve mostly got the less-resistant “B” species of Bemisia (click here for background on “B” versus “Q” ). Against “B”, you may see results with chemicals like Distance (pyriproxifen) and Kontos (spirotetremat). Dyn0-Mite (pyridaben) will also provide rapid knockdown of adult whiteflies only, so it can be used for crop clean-up. But if you happen to have mostly the “Q” (or Mediteranean) species, you are pretty much out of luck when it comes to pesticides, except, perhaps, for Dyno-Mite. “Q” is generally thought to be resistant to all our registered products for whitefly. “Q” is also impossible to distinguish from “B” without genetic testing, so you won’t know you have it until your spray program fails. Given this, biological control really is your best option for whitefly control, at least until mid-October. Why? Because, in the absence of pesticide pressure, “B” will gradually displace “Q” over the growing season (population genetics, baby!). This means that crop clean-up with chemicals near the end of the season will have a chance of working, as long as you don’t start it too early. Bemisia whitefly (left) and greenhouse whitefly (right). But even with biological control, the pest-control gods refuse to favour us. One of our best weapons against Bemisia – the parasitoid Eretmocerus mundus – is no longer available in Canada as of this year. So, we’ll have to rely on the less-effective parasitoid Eretmocerus eremicus. You’ll also want to co-release Encarsia formosa, since these will control any greenhouse whitefly that come into the greenhouse. Encarsia will also do a bit of parasitising and host-feeding on Bemisia. 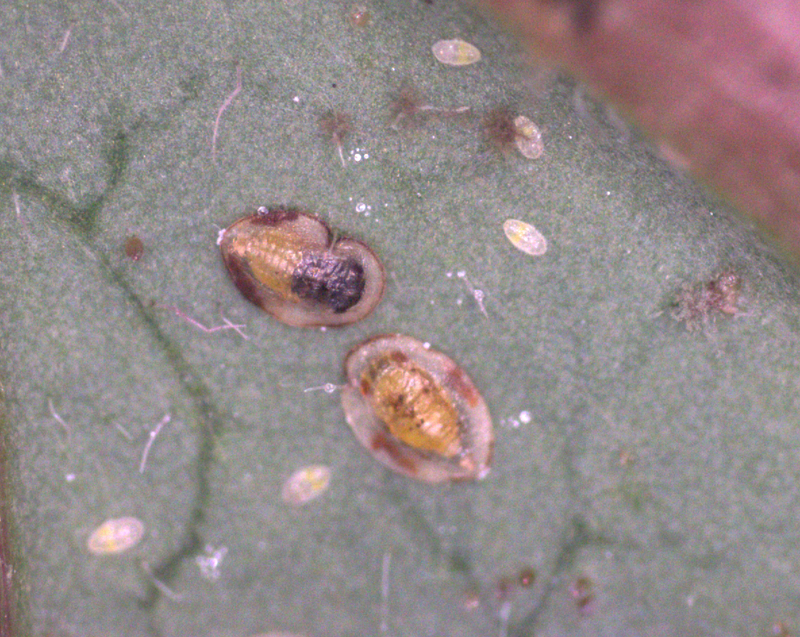 Bemisia whitefly parasitized by Encarisa (top, blackened pupa), versus one that’s been parasitized by Eretmocerus (bottom, yellowish pupa). With E. mundus gone, some growers are avoiding parasitoids altogether and trying Amblyseius swirskii and/or Amblydromalus limonicus. 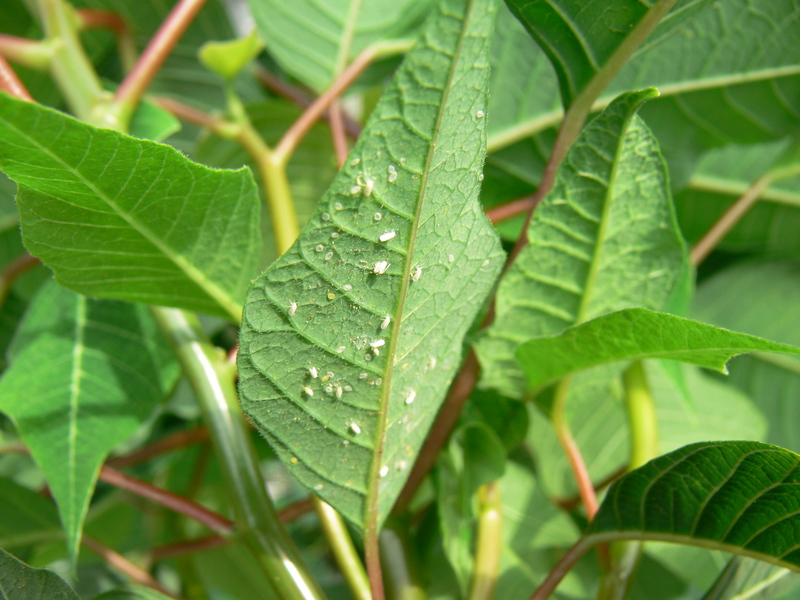 Although these mites do eat whitefly eggs and crawlers, research at Vineland by Dr. Rose Buitenhuis has shown that A. swirskii are less effective for whitefly control than E. eremicus. So, I wouldn’t rely on these guys alone. 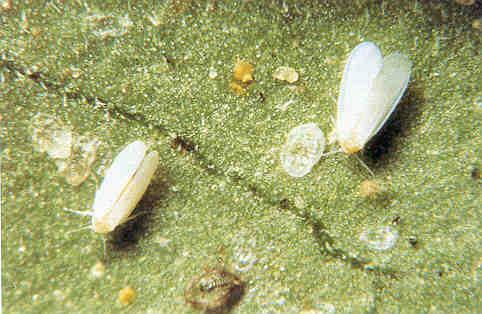 But, they may have a place alongside other whitefly biocontrols, such as sprays of Beauveria bassiana. I’d also be remiss if I didn’t mention Delphastus catalinae. This predator seems REALLY effective for our friends on the West Coast. However, we’ve historically had less luck with it in Ontario. Given their compatibility with whitefly parasitoids (they don’t attack parasitized whitefly), their use within whitefly biocontrol programs may be worth re-visiting. But they may not establish unless you’ve got a moderate whitefly population already, and they are very sensitive to pesticide residues. Ultimately, the trick will be finding the right combination of natural enemies to replace the job of E. mundus. This is why Graeme Murphy (you remember him???) and I are also looking at the potential for the generalist predator Dicyphus hesperus to aid in whitefly biocontrol programs. I’ll keep you posted on our results. 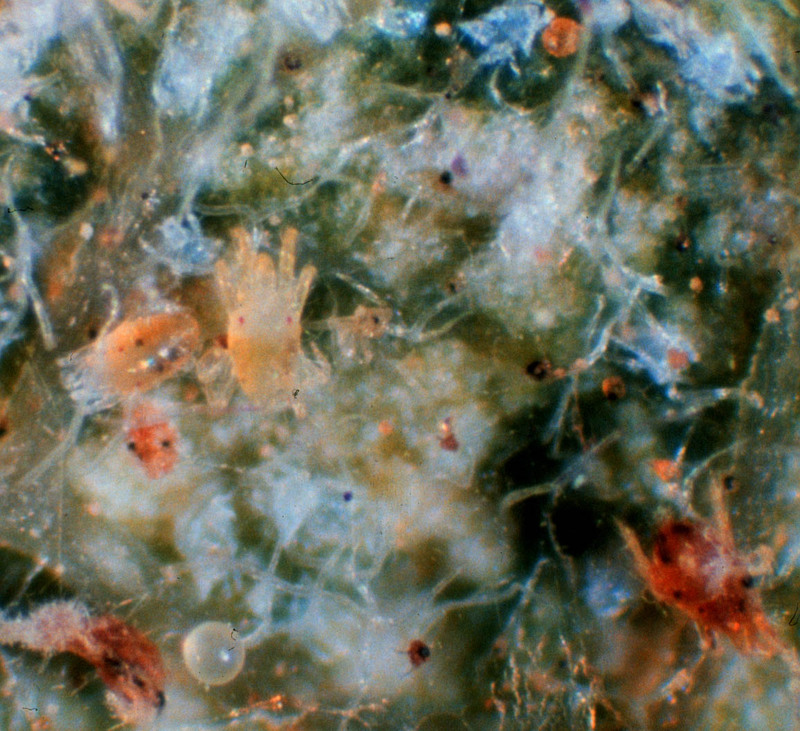 Lewis mites (Eotetranychus lewisi) . Photo courtesy of the University of Maryland. Lewis mite (a species of spider mite) can be a real problem in Poinsettia around mid-October, when populations have built up enough to start noticing damage. Early detection is difficult, since the symptoms are rather subtle at first: faint speckling and chlorosis (click for a link to pictures). If left unchecked, the upper foliage will turn brown and the mites will form unsightly webbing. Webbing caused by a severe infestation of Lewis mite. Photo courtesy of Ohio State University. Given that they are difficult to detect, many growers are turning to preventative applications of miticides. These include Avid (abamectin), Floramite (bifenazate), Vendex (fenbutatin oxide), Shuttle (spinosad) or Forbid (spiromesifen). This is usually done at the cutting stage, however. Control of Lewis mite with pesticides is more difficult now that the poinsettia canopy is filling in, since Floramite, Vendex and Shuttle are all contact miticides. Applications of more systemic miticides at this point (like Avid and Forbid) may interfere with your biocontrol program for whitefly, since they can be hard on parasitoids or predatory mites. If you haven’t already treated for Lewis mite, walk your crop a little more often and look for the characteristic stippling symptoms. Look for mites on the underside of these leaves. Lewis mite is often confined to a particular cultivar or spot on the bench, so consider throwing out infested plants, or simply do a spot spray of miticides. If you need to spray more than once, remember to rotate chemicals to avoid resistance. There are also some biological control options for this pest, one being the predatory midge Feltiellae. But, at this time of year, the midge is starting to enter diapause, so it likely won’t be active enough to give you control in time. 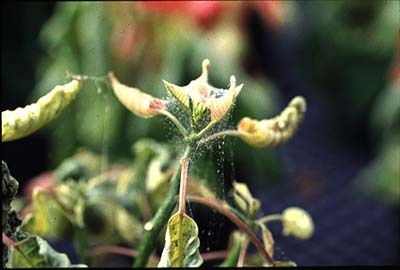 However, you might see some control with releases of the spider mite specialist Phytoseiulus persimilis. Now that the plants are off the misting bench, our focus turns from Erwinia to Pythium root rot. Wilting on a bench of otherwise healthy plants suggests Pythium root rot. Above-ground symptoms of Pythium include stunting and severe wilting. There will also be evidence of dark, wet, rotted roots. But if you’re not sure if Pythium is your problem, check out this Poinsettia Diagnostic Key from the awesome horticulturalists at NC State University. Brown roots on a wilting plant is indicative of Pythium infection. The old standby chemicals for Pythium, including Subdue (metalaxyl), Truban (etridiazole) and Previcur (propamocarb hydrochloride), still usually work for Ontario growers – but this may not be true forever. Many growers in the U.S. have been encountering fungicide-resistant Pythium strains, especially with regards to Subdue. Because of this, many growers in California have starting applying microbial fungicides at the cutting stage to boost root growth and prophylactically help prevent disease — something to think about for next year. Additionally, Dr. Anissa Poleatewich (Vineland) and I are running a commercial trial to see how drenches of microbial fungicides measure up to traditional chemicals for Pythium control over the season. Keep your fingers crossed that we get some good data to share! Whew! That was a long one! And I STILL probably didn’t cover everything! Feel free to call or email to discuss issues not addressed in this post. Commenting below on what’s working and what’s not for your particular operation is also encouraged.